20 years and my third Volvo wagon. There simply is no better or more versatile automobile. This one is a 2004, and I will sob like a baby when I have to let her go. I love your chats with Bob...I am beginning to hear the ' You're weird and I am smarter than you' pre-teenager thing starting to emerge. 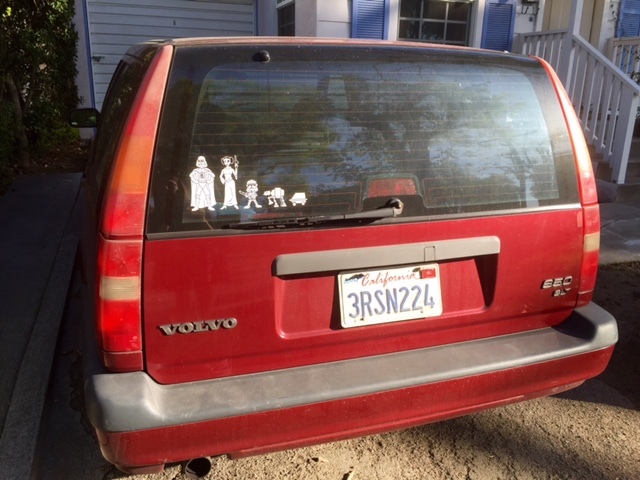 On the car, (Star Wars style), there is Mr.R, you, Bob, Ted and what? Looks like a wagon. A thing of beauty, with stories to tell. I want to be your wagon when I grow up. I love your car and would love one of my own! I think people are too quick to get rid of cars these days instead of truly living in them. We have an 1990 Toyota Tercel and it still runs great, so why give it up? LOL!! I have a 94 volvo, we call him Swen. Best care ever. Who does not love a car with a ski pass through in the trunk? And a 84 Dodge Ram Van, we call the Magic Bus. My kids learned classic rock in it best cassette player ever.